Jesus often retreated from the people to pray. Passage from Luke 5:12-16. Jesus reached out his hand and touched the man. “I am willing,” he said. “Be clean!” And immediately the leprosy left him. The passage from Luke does not tell us that Jesus sometimes withdrew to lonely places and prayed. It says He did it often. I truly believe if we read of Jesus doing something, we should pay attention because He only did what was in alignment with the Father. 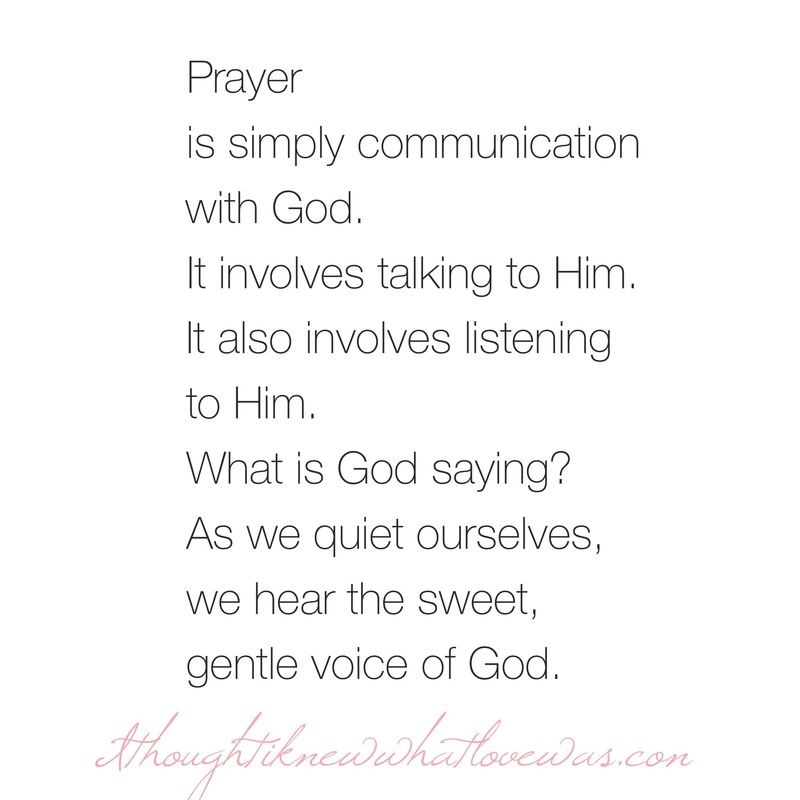 Prayer is simply communication with God. If you’re in a relationship with someone, that relationship requires communication. The foundation for intimacy (into-me-see) is built on fellowship, experience, and communication. Without communication, the other pillars of the relationship begin to crumble. They tumble to the ground. God invites us to know Him. He offers the invitation for intimacy. Why do we talk to God? Because we want to build a relationship with Him. He already knows us. Do we know Him? Because we love God. We talk to people we love. Because God enters situations He’s invited into. If we don’t pray, He’s not invited. Because we need God. He said apart from Him we can do nothing (John 15:5). Why do we retreat to lonely places to pray? So we can hear God more clearly and be free of distractions. Alone time together is more intimate. You can give the other person your undivided attention. Hopefully, they also have yours. We talk to God and listen to God because we love Him, respect Him, value Him, cherish Him, and we want to know His thoughts. When we don’t pray (talk to God), we are often leaning on our own understanding. We are worrying and fretting, filled with fear. We are powerless in areas of our lives because we have not yielded to the wisdom of God. We are anxious and insecure. We are not abiding, we are striving. Talk to God. He’s listening. You have His undivided attention. The Creator of the Universe has given you His undivided attention. Whoah! That’s enough to pause and say, ” Wow.” He’s more important than any earthly president, King or Queen, or celebrity. He’s our loving Father. You don’t have to have a long, rehearsed prayer. Talk to your Papa. Listen. One of the ways God speaks is through His word. A verse may pop into your mind or a portion of a sermon. Don’t dismiss it. Ask God for wisdom, insight, and to speak to your heart. Then listen. Pray God’s word. I’ve been doing this a very long time and was encouraged at a conference last weekend when both teachers encouraged praying God’s word. You can find scripture prayers at the top of this website. God’s word does not return void. It accomplishes all it’s sent out to do (Isaiah 55:11). Seeds of His word are spread to the world as you pray His word. They are watered by Him and bring forth a harvest. Thank God. Have you ever had a relationship with an ungrateful person? They just continually have their hand out and complain to you with their problems. If so, you know it doesn’t feel good. God likes to be thanked. Yes He does. He is not fond of complaining. Yes, we can air our concerns to God…yet the Bible tells us to continually give thanks. Intercession. Pray (ask God to help) for other believers all over the world. Talk to God about things outside your realm of influence. Talk to Him about everything. May we seek God for He is glorious! He is outstanding. And He loves to be with His children. He adores you. He wants the best for you. Papa God, may we know our inheritance in Christ and come boldly before you. Fill us to overflowing with your wisdom and give us an unquenchable desire for Jesus. May we steal away and grow to know you even more. In Jesus powerful name, amen. Thank you Heavenly Father for life. beautiful, intimacy with God is what I”m working on.